NEAAO provides an array of services for Arab immigrant men, women, children and families by supporting the resolution of different social issues to pave the way for a healthier future in Maine. We assist Arab immigrants in social integration through training for better opportunities in the workforce. We advocate for Women’s rights to prevent domestic violence and isolation by supporting with challenges and education. We allow every child to live life to its fullest by minimizing the risk of child abuse and substance abuse. We support higher education for teens. NEAAO maximizes the capability our community members by empowering individuals to be more independent and connecting them to resources. NEAAO seeks to engage Arab Americans in volunteerism, including training in youth leadership. MeMyRight: is a program, in partnership with Family Crisis, built to educate women about their rights, options, safety plan and children’s safety. We know that domestic violence is not part of a normal life to endure. NEAAO provides workshops to empower women to take control of their lives, and be productive and positive by having a voice and resources to stop DV. NotAlone: is a program that helps women, especially elderly women, to know that they are not alone. We are creating a safe environment where they can feel safe and build their support system by trusting others and community members. TogetherConnected: is our Arabic school, NEAAO helps parents keep their relationship and social ties to their children. Trapped with the language barrier, parents start losing the ability to communicate with their children in their mother tongue and struggle more during their transition and integration. Keeping the Arabic language will help children improve their personal, social, intellectual, educational and economic future potential. Observation and surveys with families in Westbrook show that women in the Arabic community are struggling from isolation. Some were oppressed in their home country and continue today to have fewer opportunities in education, family, and career. Looking different in a hijab, many are feeling fearful and going through a severe stage of grief with the loss of their home, extended family, and primary language. NEAAO creates a safe environment where women can build trust and support system and be educated by each other while attending sewing, swimming, fitness and group therapy classes together. Participants develop a profound sense of belonging and experience improved mental health and reduced stress in their social lives. NEAAO found that working with children 6 to 15 is another way of meeting community needs and ease social integration. NEAAO acknowledges this challenge and found that many Arab immigrant children did not have the opportunity to learn reading or writing in their mother language (Arabic) due to war or immigration. By starting schools in the United States school system, Arab immigrant children find themselves in a new physical environment. The classroom is new, most of the classmates are strangers, the teacher is a stranger too. NEAAO is supporting the Arab community by creating an Arabic school where children ages 6 to 16 can join for free and learn reading, writing, and communicating in Arabic or home language. This program is offered every Saturday from 11 to 3. In this program, the curriculum is geared toward addressing conflict resolution and positive peer interaction, with the goal of developing social supports for participants. New England Arab American Organization serves now people from two locations: Westbrook and Portland. NEAAO services are free for all Arab immigrants or refugees that live in Portland and Westbrook. NEAAO cultural brokers are also continuing services for families that moved from Westbrook or Portland to Biddeford or Augusta. Our services are also provided for many non-Arabic immigrants that are in need to help and support them during their resettlement in Maine—like many Afghani families living in Westbrook. The population of focus is refugee children and women who have or are at risk of mental health issues due to complex trauma related to war, persecution, resettlement, and acculturation. NEAAO works with these individuals to create community resilience building and improve the sense of belonging by reducing the feeling of discrimination and racial inequity and injustice. Building Bridges Dinners: This program allows many host community individuals to share a meal and get to know their new neighbors and why they are here. Without genuine personal interactions, it’s too easy for assumptions and misunderstanding to take hold. Educational Cultural Competency Workshops: Each workshop is tailored toward the need of the attending audience. From our day-to-day work at NEAAO, we know that refugees come from every religion, culture and background. Part of our work is to listen deeply and look at the messaging work in front of us as a chance to educate those in our community about a subject that they may know very little about. New England Arab American Organization programs will compliment these organizations and be the liaison for better service and social integration. We offer group training for the United States Citizenship Exam. We teach American history, government and culture, and prepare clients for the speaking, reading, and writing portions of the test. All materials are offered and approved by the immigration office. Please email NEAAO office at info@neaao.org or call the organization for more information. We offer a group training for the United States Driving Permit. We teach the driving permit material offered by the Department of Motor Vehicle in Portland. New England Arab American Organization is always supporting a safer community. We acknowledge that transportation is highly needed in order to meet the essential needs of any family. NEAAO once again is reponding to the need of the community to remove barriers to self-sufficiency. New England Arab American Organization is careful to provide a culturally sensitive learning environment in which students can feel comfortable. In partnering with LearningWorks, classes focus on many aspects of learning English, and cater to the needs of our participants, varying from basic literacy to forms of conversation practice. Emphasis is placed on self-efficacy and language for day-to-day interactions. Classes run from 9:00am to 11:00am Monday/Wednesday/Friday. All classes are held at NEAAO office in Westbrook located at 426 Bridge street Unit B10. Students are required to register for open spaces in the class. A placement exam is administered to each incoming student. New England Arab American Organization's initiative is to fulfill the mission of bridging the gap between the cultures by creating the space to bring people together over food, music and fun. People from both the host community and the immigrant community get together representing neighbors, city officials, teachers, interfaith leaders, old and young people of color with different ethnicity, religious beliefs and race. NEAAO plays the role of the moderator to plant the seed of friendship, education, and fearless interactions and relationships. Please, see our press links for reviews on our 2016 and 2017 building Bridges series. In August 2016, New England Arab American Organization played a very essential role in restoring trust and safety within the Arab immigrant community and especially Muslims who received a threat letter on August 17, 2016. New England Arab American Organization engaged in building a collaborative effort with Westbrook City Officials and the Westbrook Police chief to rise above fear. Together we were stronger and in unity we restored safety to the lives of Muslim families living in Westbrook. By building coalition, the law was enforced and presently, NEAAO is the leader in outreaching the community and being the voice of immigrants for social justice and equality. New England Arab American Organization offers Cultural Competency Training includes two-hour presentations, half-day and all-day workshops, and individual and group consultations. Supported by permanent and temporary exhibits and a rich assortment of educational materials, the presentations help educators or providers develop the cultural competency they need to understand and communicate effectively. Fee for cultural Competency Training and materials are discussed upon demand. Dialogue Groups aim to advance dialogue on race, culture and ethnicity among different providers. NEAAO is trained to participate in different panels to discuss cultural differences, gender and justice for women in the Arab immigrant community. Participants develop awareness and connections to diverse cultures through storytelling, videos, presentations and role play. 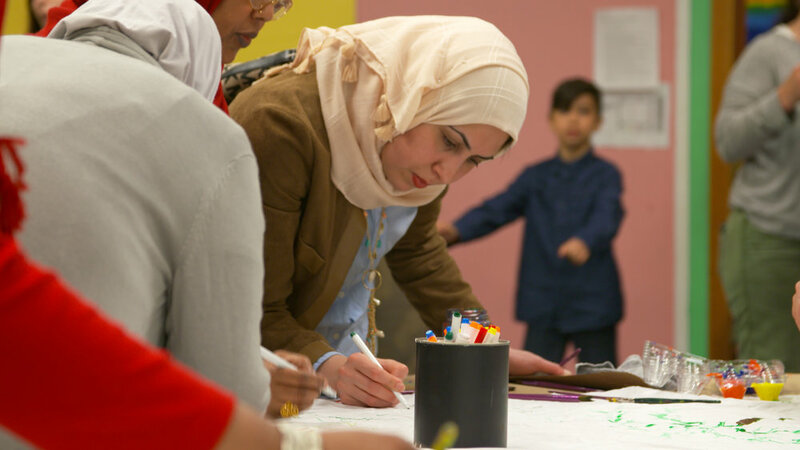 New England Arab American Organization paves the road for providers to walk the steps of immigrants by introducing beginner and intermediate Arabic classes that includes learning Arabic words, traditions and common expressions and greetings. Providers will be able to communicate in Arabic with the community. NEAAO helps remove another barrier and bridge a new way to eliminate fear and differences. Providers with daily interaction with immigrants are encouraged to take this training. Come join us for magical music lessons using the oriental musical instrumentOud for beginners. Learn basics about the instrument. By the end of the 4 week class, you will be able to play a basic Arabic song on the Oud. Choose two hours from multiple sessions each Monday and Wednesday from 4:00pm to 7:00pm. Bring your own Oud or rent one of the available instruments for an additional fee. A program, in partnership with Family Crisis, built to educate women about their rights, options, safety plan and children’s safety. We know that domestic violence is not part of a normal life to endure. NEAAO provides workshops that empower women to take control of their lives and be productive by having a voice and resources to stop DV. Together we can fight violence and have alternatives to live in peace. Discussion to stop Domestic Violence is offered for women and men too. To make a change, we all must do our part in it. A program that helps women and especially the elderly to know and feel that they are not alone. New England Arab American Organization surveys show that women in the Arabic community are struggling from isolation. Some were oppressed in their home country and continue today to have less opportunity in education, family, and career. Looking different in a hijab, many are feeling fearful and going through a severe stage of grief with the loss of their home, extended family, and primary language. New England Arab American Organization continued evaluation surveys to create program that the community need. We are creating an environment where they can feel safe and build their support system by trusting others and community members. Women come together to do fun activities like sewing, swimming, fitness group therapy classes. Together, we are creating a support system, and new relationships with neighbors from the host community to feel part of the community. Participants develop a profound sense of belonging and experience improved mental health and reduced stress in their social lives. • Parenting outreach workshops to assist parents with the challenges of living in an unfamiliar environment, with a new language and rights. We provide the resources needed to support facing these challenges. • Special education to empower women and strengthen the support system of Arab women living in Maine. These workshops will be tailored to create a safe environment for women and remove language barriers and fear of looking different. • Educate to prevent future child abuse within the family. Educate parents about regulations and child rights for safety and protection. Educate about acceptable versus non-acceptable disciplinary action against a child to prevent separation of the family. • Educational workshop supporting parent’s knowledge around Infectious Diseases. • Substance abuse and Tobacco Prevention. NEAAO prides itself in serving much of the Arabic community in Westbrook, Portland. NEAAO Executive Director, as a MANA board member and in partnership with Goodwill Workforce, is proud to identify candidates that have the right qualifications to be retooled to be an active participant in the workforce. NEAAO is a small piece of the puzzle with many role-players like CEI, Goodwill Workforce, Portland Adult Education, Chamber of Commerce, MDF, Portland Economic Opportunities Office, colleges and more. NEAAO workforce mission is to assist in matching people with jobs, and empowering individuals by providing them with the skills and resources necessary to eliminate any dependency or impediment to self-sufficiency. Finding these talents will add to the diverse fabric of the community and bring additional resources for those looking to live independently and give back to the community. TogetherConnected: is our Arabic school, NEAAO helps parents keep their relationship and social ties to their children. Feeling trapped with a language barrier, parents start losing the ability to communicate with their children in their mother tongue and struggle more during their transition and integration. Keeping the Arabic language will help children improve their personal, social, intellectual, educational and economic future achievements. NEAAO acknowledges this challenge and found that many Arab immigrant children did not have the opportunity to learn reading or writing in their mother language (Arabic) due to war or immigration. By starting schools in the United States school system, Arab immigrants children find themselves in a new physical environment. The classroom is new, most of the classmates are strangers, the teacher is a stranger too. The structured way of learning is also new. If, in addition to these things, there is an abrupt change in the language of interaction, then the situation can get quite complicated and can negatively affect the child’s progress and behavior by suppressing children potential and liberty to express themselves freely. It dulls the enthusiasm of young minds, inhibits their creativity, and makes the learning experience unpleasant. All of which is bound to have a negative effect on learning outcomes. NEAAO, however, is supporting the Arab community by creating an Arabic school where children ages 6 to 16 can join and learn reading, writing, communicating in Arabic or home language. This is a great tool that can help children navigate their new environment and bridge learning at school with the experience they bring from home from Arabic school. New England Arab American Organization is starting a new program that provides the space for a weekly discussion circle where young high school women can discuss issues that are specifically relevant to our community. Conversations would stem out of discussions on identity, how to recognize systems of the patriarchy working within our cultures and communities and how to sensitively resolve them. These conversations can happen by bringing in facilitators with the expertise to discuss the topic at hand, or through visual presentations and film discussions. We choose women mentors in our community who have studied in or are activists around women's issues.